Last week I described how Cisco Modeling Lab (CML, the product formerly known as VIRL) works behind its fantastic UI, and promised more information about the UI once I get access to a preview version of CML, which I got a few days ago. Here are the results of the first brief stroll down the virtual lane. CML has two major components: a network modeling engine (AutoNetKit) and a simulation engine. After creating the network model (including initial configurations) in the modeling engine, you can start the simulation, either locally or somewhere else. The communication between the UI and back-end simulation engine runs over HTTP, allowing you to build all sorts of interesting simulation-as-a-service environments. After a brief struggle with the initial setup (totally my fault, I should have read the documentation first), I got to the main topology window, which allows you to add new devices to the simulated network. Adding nodes is exceedingly simple: click on the node type, click on the topology canvas, and you have a new node. You can set a node’s properties immediately after adding the node. As you can see in the following screenshot, AutoNetKit helps you build BGP and OSPF (or IS-IS or EIGRP) topology, and layer-3 VPNs. Next step: connect the devices. As simple as clicking on them. Device interfaces are created automatically (and they all have to be Gigabit Ethernet interfaces – no serial links or ATM … but then it’s pretty easy to simulate serial links with PPPoE). Last step (or maybe the first one if you read the documentation ;) – set global AutoNetKit properties. You can decide to have IPv4, IPv6 or dual-stack network, set address ranges, choose the default routing protocol, and a few other bits and pieces. AutoNetKit did a great job – all the BGP sessions are configured correctly (IBGP between loopbacks, EBGP between directly-connected addresses) and OSPF runs only within an autonomous system. Want to replace IOS devices with IOS XR devices? 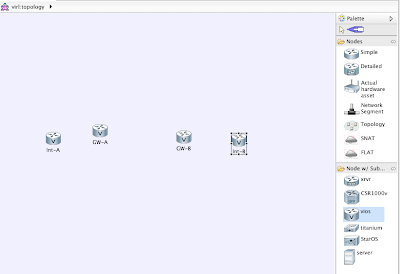 No problem, change the node subtype in the network topology from vIOS to xrvr, click on the build configurations icon, and you have initial configurations in IOS XR format. You could (if you wish) modify the initial configuration files, but it’s probably much simpler to do that in a running network (and then extract the configuration files before shutting down the network model). Once all the nodes become active, all you have to do is click on a node and telnet to its console port. 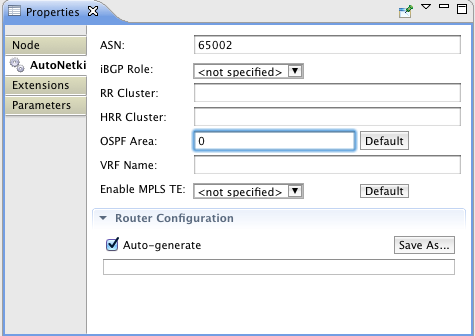 Having automatically generated initial configurations with IP addresses and reasonably configured routing protocols is awesome. Whenever I wanted to do a quick test of a new IOS feature in the past, I spent more time creating the initial router configurations (or browsing through previously created topologies and configurations, trying to figure out which ones would closely match my current requirements) than doing the actual tests (I even wrote a Perl script to create the configurations). 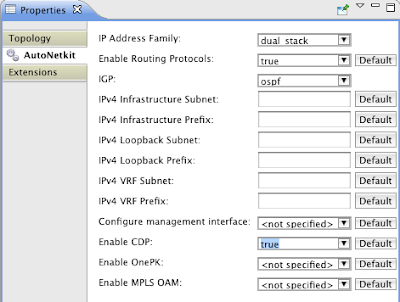 The ability to create a topology on the fly and get a running network in a few minutes is priceless. Sounds great. Any more news on availability date, target customer, pricing etc? I saw this live at Cisco Live Orlando 2013. From what they told me, they are going to have three different models. 1) an Ubuntu VM that users could run a their laptop (free). 2) A hosted model where users can pay for "virtual rack time" (think Junosphere). 3) An appliance that is production grade for companies that want to model their network and test changes before applying it in production (not free course). Not sure if this is still what Cisco's plan is. The version I saw was running on Vmware Fusion on a Mac laptop. 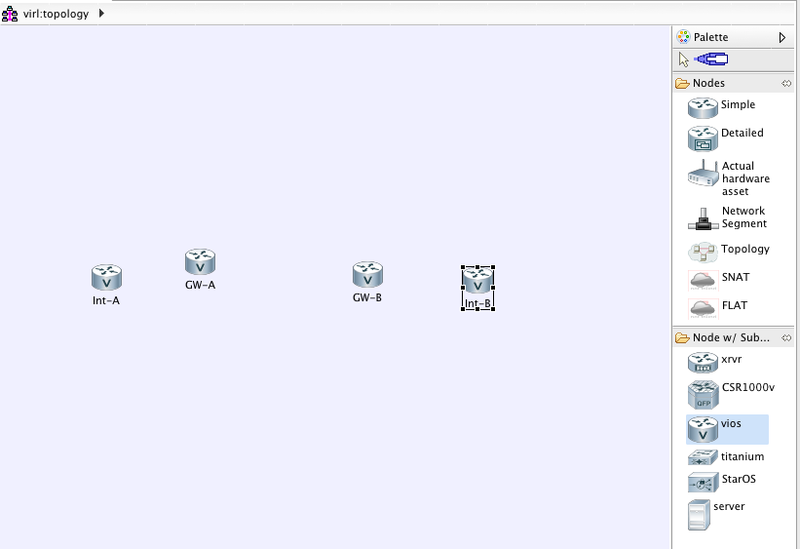 The front end application was pointed at a back end server where all of the VMs were running. 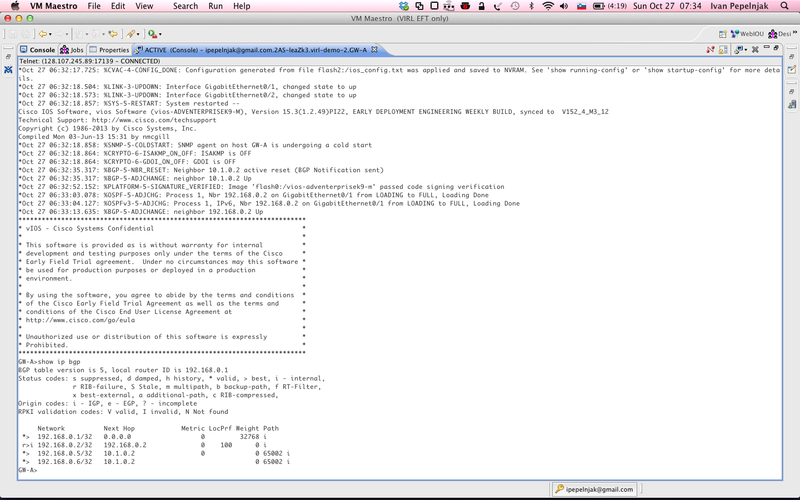 Just like in GNS3 where you can specify a remote hypervisor (running on Amazon, etc). Another notable feature is that you are not just limited to running the Cisco IOS VMs. Since it leverages KVM, you can also virtualize host operating systems, or any other "virtualizable" thing. This means that one can integrate all of these other VMs on the topology (just like one can use a host operating system vm with GNS3). It also provides means of connecting the topology to the physical network. 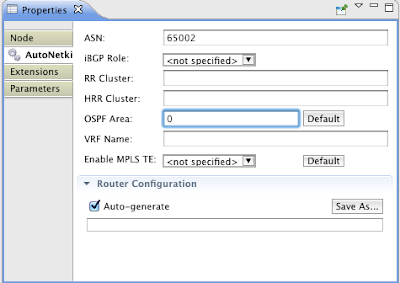 For example, a company using the appliance could feed the BGP table to the virtual network via a BGP session between a virtual XR instance and a physical BGP router on the network. Does anyone know if layer 2 will be supported in virl, like iou does? From what I was told, there is still no solid l2 support. 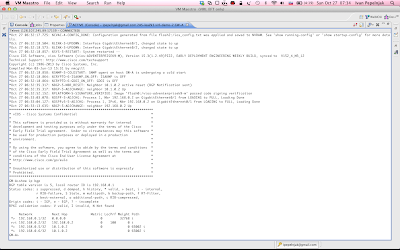 That is the one of the main reasons why the whole CCIE lab is still not yet based on virl. You will have access to Titanium (Nexus OS), but this is not like the l2 switches that you have in IOU. still no feature lacp on nexus virl?